CelloJoe can provide various musical entertainment services for weddings. From classical to alternative funky beatbox cello grooves to DJing a dance party, CelloJoe can perform for ceremonies, cocktail hours, and dance parties. 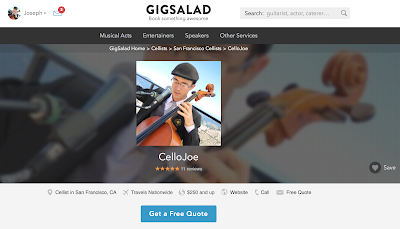 Please check out reviews of CelloJoe on Gig Salad and Yelp! Please call or text CelloJoe at 650-208-7149 or email: CelloJoe@CelloJoe.com to inquire about availability.